B Communications’ education vertical marketing program is committed to providing the resources required to succeed in the market. Please visit the appropriate education market segment page for specific segment information, program initiatives, and links to resources. The foundation of a K-12 solution is helping school districts to improve student outcomes. Student success is dependent upon a number of factors, including school environment. Key variables include adequate funding, the quality of learning, student / teacher ratios, parent involvement, and the climate for learning. B Communications’ Solutions Portfolio maps directly to these key areas of focus. College and university students have evolved the way they communicate. They are permanently connected, using multiple media and devices at the same time to create and nurture complex social networks. As students have become more sophisticated, so too have their expectations for personalization, integration, and immediacy. 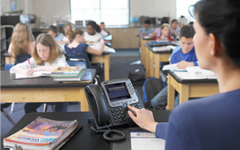 B Communications is working with colleges and universities to change the ways they think about unified communications and its role in education. Higher education is under increasing pressure to reduce costs, keep tuition increases low, and serve more students outside traditional geographic boundaries. They are witnessing rising demand for re-training and distance learning, along with requirements to facilitate inter-campus work groups and project collaboration.